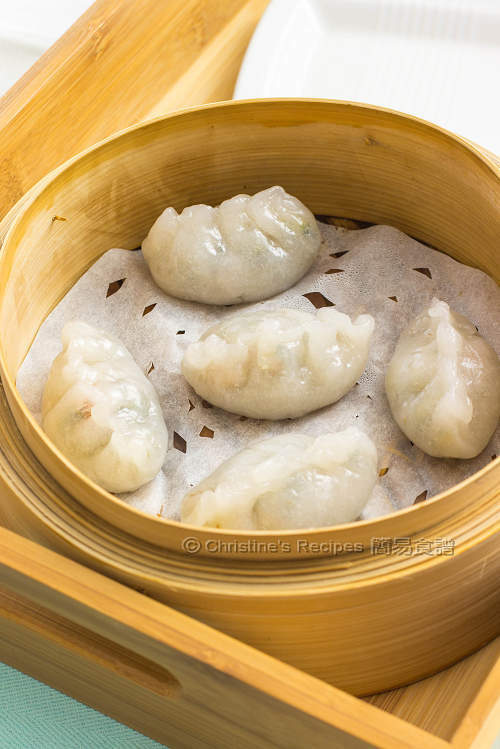 This popular Chinese dim-sum, Teochew dumplings can be made at home. Best of all, it's healthier. Make more in advance, then you can enjoy whenever you crave for some. Would I make Teochew dumplings (aka Chiuchow dumplings) at home? When living in Hong Kong, I wouldn’t give it a thought. Chinese restaurants are everywhere. I could enjoy any dim sim at any time anywhere. But if I make my own dumplings, I can choose any ingredients I like. The taste is tailor-made and surely suits my personal preference. I don’t use lard, so it’s much healthier. You can make as many as you like, then keep them in freezer for up to 3 months. When you crave for some, just steam them in a wok. They are served as a perfect Chinese breakfast or afternoon tea. What a bliss having dim sum enjoyed at home. Mix the pork with marinade. Set aside for about 30 minutes. Heat oil in a wok over medium-high heat. 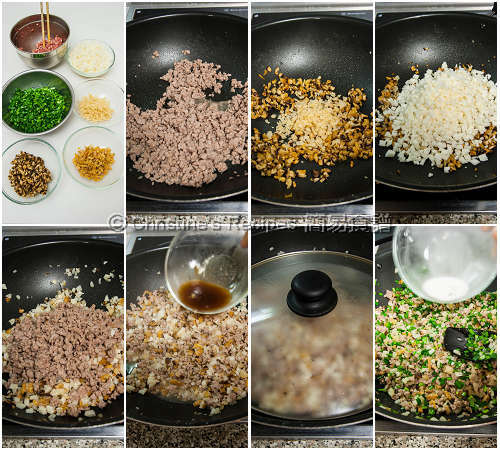 Stir fry the pork until cooked. Set aside. Sieve the wheat starch, potato starch, salt and sugar into a large mixing bowl. Pour in the boiling water. Quickly stir the mixture with a pair of chopsticks into a paste. The paste is quite sticky at this stage. 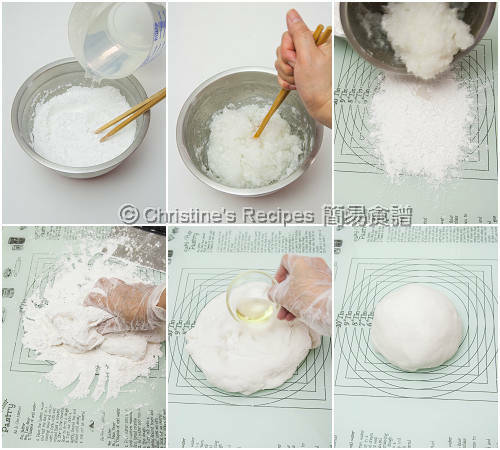 Turn the paste into tapioca flour on a clean surface. Knead into a smooth, non-sticky dough. Continue to knead in the oil bit by bit. Roll it into a round shape. Roll out the dough into a long tube. Cut into equal portion, each 20 grams. Roll each portion into a small ball and flatten with your palm. With a rolling pin, roll into a 8cm/3inch-diameter disc. Scope a heaped teaspoon of filling. (Remember to add the peanuts.) Fold the wrapper in half and seal the edges.（Note: Cover the rest of the dough portions with a cloth while wrapping.）Repeat this step to finish wrapping the filling. Line a baking paper in a steamer. Steam dumplings over high heat for about 8 to 10 minutes. Serve immediately with soy sauce and chilli sauce. You can make the filling beforehand and chill in refrigerator. When you're needed, place at room temperature for 15 minutes before wrapping. Then mix in the peanuts. It’s important to wrap the filling tightly. If the edges of wrappers contact some oil, it’s hard to crimp together. Don’t panic. Simply damp with some water. Yam bean is strongly recommended as it lends a sweet, crunchy touch. 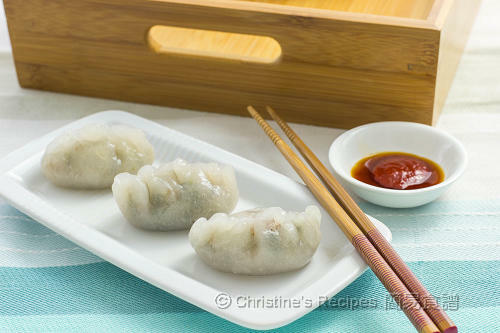 Each dumpling should be 1½-inch apart while steaming. Otherwise they stick together when hot. I love teochew dumplings more than shrimp dumplings! These look yummilicious, Christine. Every kind of starch yielded in this recipe has its unique function. Wheat starch can produce the translucent effect and potato starch can help bind together. Rice flour or corn flour can't substituent the both above. Hello! I didn't have potato starch and really wanted to make this, so i used cornstarch instead. It worked out fine for me (maybe not as good as the original, but it was fine for me). The dough was maybe a bit fragile and sticky sometimes, i don't know if it's because of the substitution. But it steamed up really nicely, chewy and translucent. Is wheat starch wheat flour? That is what i used (plain, all purpose wheat flour). Thank you for such great recipes Christine! They are really perfect. I discovered your blog recently. I was looking for a way to use the water chestnut flour i had bought accidentally. And as someone who grew up in Malaysia, i always long for the tastes of my childhood. Now i can make them at home! Your recipes are very well written and well tested, even when i bring in variations, they work perfectly. And thank you for introducing me to tangzhong. I bake bread almost everyday and this method has changed my life! 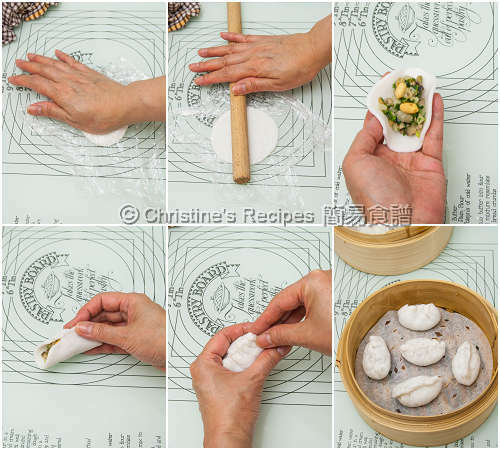 The potato starch helps to make the dumpling wrappings stretchy and not easily torn apart. Cornstarch can't produce this texture. So that's why your dough was a bit fragile. As for the wheat starch (澄麵), that's not the same as plain wheat flour that people use to make bread. Please click to my previous post of radish cake and see the photo of it (the top left of the second picture). You can get wheat starch from Asian grocers. Wheat starch can make your dumplings translucent. Will the skin stay soft the next day if I do not refrigerate them. This dim sum is best served hot. All dim sum restaurants will steam them before serving. If the weather is too hot, it's better to keep them in fridge. You can reheat them by steaming and the skin will be soft again. I'm wondering if Erawan Tapioca starch https://www.amazon.com/dp/B007EFOEOW/ref=pd_lpo_sbs_dp_ss_3?pf_rd_p=1944687682&pf_rd_s=lpo-top-stripe-1&pf_rd_t=201&pf_rd_i=B000EYC096&pf_rd_m=ATVPDKIKX0DER&pf_rd_r=6ABA9ZAK3BXF3B3WH924 can be used in place of the potato starch due to the word 生粉 on the package? Thank you Christine. Tapioca starch is not the same as potato starch. These are two different flours produced by different plants. Tapioca starch should be 木薯粉 or 菱粉. So you can't replace the potato starch with tapioca starch. They produce very different textures.